Welcome to those of you joining me from Pursuing The Magic and those of you just hopping aboard. I am the 2nd stop on our Magical Blogorail. The Magical Blogorail will soon be adding two new members to our family, so today we decided to host a Winnie the Pooh Baby shower for Jennifer & Beth. 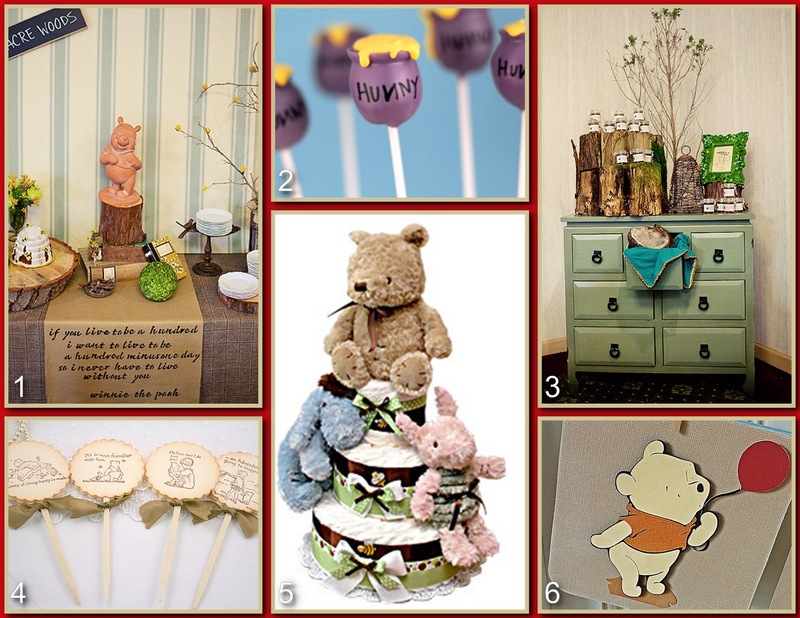 For the shower I wanted to go with a classic, more muted Winnie the Pooh - I think it's the perfect way to visit the 100 Acre Wood for an adult party. I love the rustic, yet sophisticated feel of the cake and favor tables - and they can be done with items easily found at a home and garden store. Notice how the books were used as a base for Pooh's stump base, and the nostalgic Pooh book propped against it is the perfect finishing touch. Pooh Cake Table - I love everything about this table, from the Pooh garden statue poised on a tree "stump" to the rustic burlap and kraft paper with one of my favorite quotes, "If you live to be a hundred, I want to live to be a hundred minus one day so I never have to live without you." Honey Pot Cake Pops - Bakerella has done it again!! These cake pops are so cute and can go with a whimsical modern Pooh or classic Pooh theme. Favor Table - As you can see this old dresser repurposed as favor table compliments the cake table perfectly. I love the rustic look it, and notice the varying heights of the items on the dresser. Pooh Cupcake Toppers - Classic Pooh, Tigger and Piglet are so cute on the cupcake toppers. You can also use them on water bottles or embellishments on ribbon napkin holders. Pooh & Friends Diaper Cake - This diaper cake is so cute, and gender neutral. I love the classic plush Pooh, Piglet & Eeyore. Here is a tutorial on making a generic diaper cake, you can add the ribbon and plush of your choice. 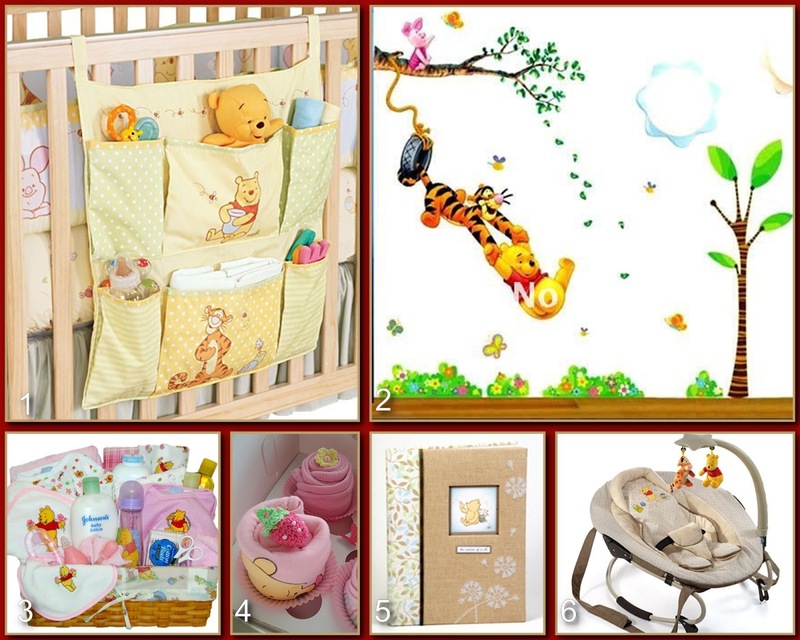 "Oh Baby" Banner - This classic Pooh banner in neutral colors spells out "Oh Baby!" and is the perfect finishing touch to welcome the Moms-To-Be and their guests. What's a baby shower without gifts? Here are a few gift ideas that are sure to please Mom, Dad and Baby!! Crib Organizer - This crib organizer is so convenient for all of your diaper changing and baby care needs. Mommy will have everything she needs at her finger tips with this Pooh and Friends organizer. Wall Decals - You can create a 100 Acre Wood for your little girl/guy using these adorable wall decals with Piglet, Tigger and Pooh. Bath Basket - Everything you need for bath time is right in this basket, from baby bath to washcloths - there's even a baby manicure kit!! Receiving Blanket Cupcakes - These cupcakes look good enough to eat...made of receiving blankets and onsies and "served" in a cupcake box, they make a very cute gift. Memory Book - Help Mom & Dad get started documenting all those great milestones of a baby's first year with this Winnie the Pooh baby memory book. Bouncer - This bouncer is sure to be very comfortable for a little Blogorailer - and when they get a little bigger they have Pooh & his friends to play with. Thank you for joining me today. Your next stop on the Magical Blogorail Loop is Growing Up Disney. Great ideas! Those receiving blanket cupcakes are cute enough to be both a decoration and a gift! Thanks Jodi!! Hope you're having a FABULOUS day!! Everything is so cute Donna Kay, I love combining Classic Pooh and Present Pooh. I love how we both thought of the Hunny Cake Pops, they are so cute..
so stinkin' cute! I love the bouncy fit for a Blogorailer! You all are so sweet to do this for us! I just wish we could do it all in person! Love you!!! Donna, you are so right- this is a polished look, yet so playful at the same time! I absolutely LOVE the "Receiving Blanket Cupcake"!!! Thanks :D!! I think I am going to have to try to make the blanket cupcakes I can use them for decoration at Ash's shower and she can use them for Baby Eric when he arrives. I'll let you know how they turn out. All so cute!! Those cake pops are adorable! Thanks Jenn!! I can't wait to meet our next little Blogorailer!! All so cute!! Love the soft colors!! All great ideas!! Thanks Deb!! Thanks for stopping by, this special loop has been fun.